From Stockholm to Las Palmas. Las Palmas 28 July - 01 August. We will sailing from Stockholm, through Nord-Ostsee-Canal. We continue and enter The Netherlands and enjoy some of the beautiful Dutch canals cruising parts of standing mast route. We then continue out in the English canal on the French side. Further we cross bay of Biscay and arriving north of Spain. Sailing from there with coastal cruising in Portugal and jumping over to Madeira. Finally coming to Canary Island were we will be cruising to 1st of august. Welcome to sail with us for one leg or more!, Note: depending on whether time schedule and ports are subject to change since we wish to enjoy sailing in good conditions. 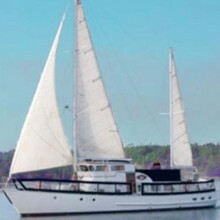 Boat descriptionVery comfortable ketch with 3 separate cabins. 2 heads with 2 showers. Plenty of space to relax on.